Boko Haram still controls parts of northeastern Nigeria, and the hundreds of school girls abducted a year ago aren't the only children that have been impacted by the Islamist militant group's reign of violence. UNICEF released a report on Monday that says 800,000 children have been forced to flee their homes due to the conflict. Because of this staggeringly high number, UNICEF launched the #BringBackOurChildhood social media campaign on Monday as well to raise awareness for the kids missing out on a childhood in Nigeria. The UNICEF "Missing Childhoods" report says, "The number of children forced from their homes has more than doubled in the past year." 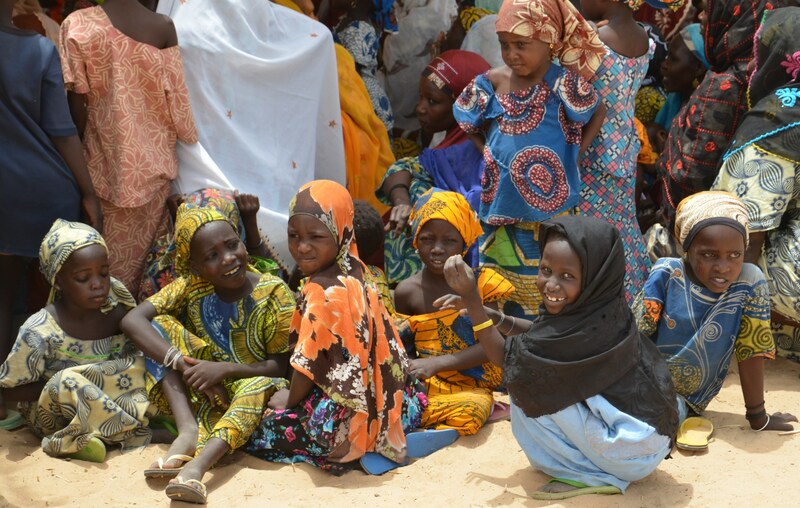 More than 1.5 million people have fled their homes after their villages were attacked by Boko Haram, and the majority remain in Nigeria, staying with host communities with little access to humanitarian aid. The militant group has only become more violent recently, killing 1,000 civilians so far this year, according to the report. Because of this, Nigerian children are growing up surrounded by violence, uncertainty, and fear. The #BringBackOurChildhood campaign, much like the previous #BringBackOurGirls campaign, aims to end the attacks on children and restore Nigerian kids' ability to just be kids. Snapchat celebrity Shaun McBride (known as Shonduras on social media) and multimedia marketing company Softway Solutions partnered with UNICEF to create an interactive campaign across all social media platforms. McBride posted a video on his Snapchat urging his fans to recreate a drawing by a Nigerian child displaced by Boko Haram on Snapchat and spread the hashtag #BringBackOurChildhood. The campaign is already gaining traction on Twitter, and if it's anything like #BringBackOurGirls, it will likely attract attention from more celebrity supporters. Children have become deliberate targets, often subjected to extreme violence – from sexual abuse and forced marriage to kidnappings and brutal killings. Children have also become weapons, made to fight alongside armed groups and at times used as human bombs, including a case of a young girl sent to her death with a bomb strapped to her chest in Maiduguri. #BringBackOurChildhood is on Snapchat, Twitter, Instagram, and Tumblr, sharing the drawings of Nigerian children displaced by Boko Haram's violence. "They left home in a hurry without anything," McBride's website says. "So the drawings are overwhelmingly a nostalgia for everything 'home.'"